Click the following link to see video interviews and action from the Troy Lee Supercross Lites audition. Click the following link to check out additional photos from the Troy Lee Supercross Lites audition. When it comes to adding riders to a motocross team, selections are generally based on a team’s prior knowledge of what a rider can do. There’s rarely ever much in the way of a tryout, much less a group audition. But there are exceptions to the rule, and we recently got to check out the process used by the Troy Lee Designs crew as they worked to select a second rider for their new Supercross Lites team. They’d already signed Chris Gosselaar as their first rider, and invited Gavin Gracyk, Justin Keeney, Adam Cini, Sean Hackley, and Kyle Partridge out for a day with the team. Jeff Ward and TLD's Bob Weber talk over some of the morning's activities. While lap times weren't the primary focus of the test, there might have been one or two on hand. After all the time he's spent sidelined with injuries this season, it was cool to see Sean Hackley back on a bike. Li'l Goose will handle lots of the testing duties for the team, but will also be chasing the title. 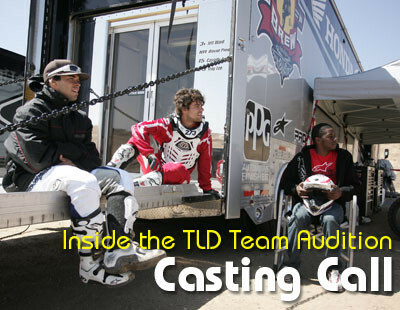 After each rider's turn on the track, they got a full meet-and-greet to download what they were feeling with the TLD crew. So who made the final cut? We’re still waiting to hear, though it should be finalized this week. In the meantime, be sure to check out the photo gallery and video links above, for much more from the day.